There are many things that cause my sick twisted mind to chuckle and snicker at the things I see on a daily basis. It is on one of the benefits I get for being me. One of those often pondered issues steeped in both contrast and conflict is fishing and technology. 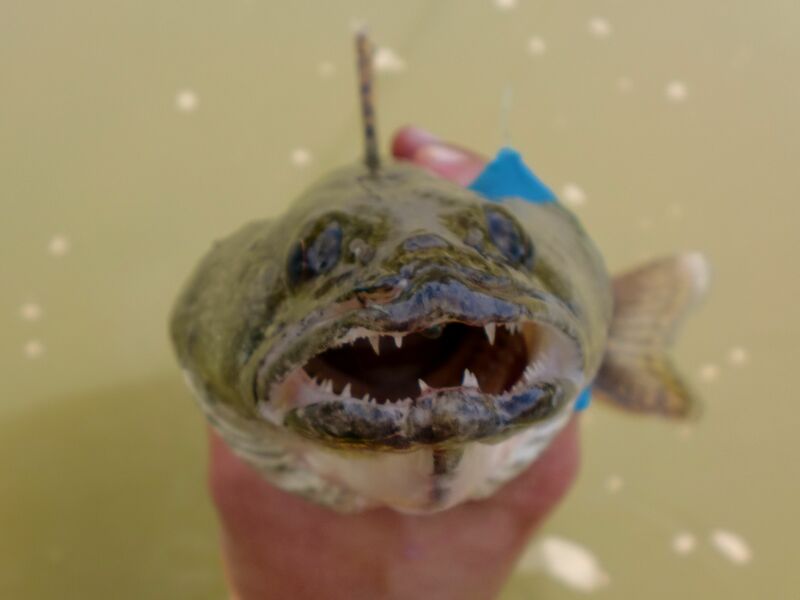 I hear so often how offended fishing purists are when a fellow angler (fly or other) shows up to the stream, lake, or river with some “new fangled gadget”. I can hear the pining for the good old days of bamboo and horse hair rising off of the rippling water. Whether we like to admit it or not, just like every aspect of our society, technology has had a tremendous impact on our fishing experience. You almost never step onto a boat that is not equipped with some form of sonar and or GPS technology. Bass boats are often equipped with automatic trolling motors that keep the boat moving parallel to the shore line using similar technology. Before you fly fisherman start to snicker at the bass boys….. How many of us are wearing breathable waders made of high tech fabrics that were not even available 25 years ago. High modulus graphite, sealed carbon drags, ultra light weight machined aluminum reels, flourocarbon tippet, boga grips, flies made of synthetic materials, laser sharpened hooks….. and the hits just keep on coming! So does this mean we should all outfit our waders with a batter pack and a laptop shelf… or edit our video stream side from our smart phone so we can tweet it to the masses before we even crawl out of our waders? Well that is not exactly my cup of tea, but the option is yours! I would say this though…. before you look down your nose at they guy with his iphone, video camera, or whatever the offending gadget might be… Ask yourself what your grandfather or great grandfather would think of you if he saw all of the crap that you carried with you and used in your fishing endeavors. The truth of the matter is that unless you choose to adopt an “amish-esque” approach to your fishing you can’t help but to be impacted by technology. I for one am a huge fan as long as you don’t lose the all important perspective of why you bothered to go in the first place! I consider my time on the creek to be my harbor in the tempest of life. It is my time to re-connect with the natural world around me. It is my time to cleanse my brain of the life based concerns that I will heap back upon it as soon as I arrive home. It is truly the one time of my day that is my time and no one else’s and it is my favorite time. I truly embrace what technology has allowed me to do with my fishing experience. I am able to capture beautiful moments and freeze them in time. It allows me to share them with my father who lives half way across the country and he can smile knowing that the lessons he bestowed upon his son are still alive and well 30 years later. I am able to fight fish in ways that would have been difficult in the past. It allows me to create fly patterns that would be difficult if not impossible if limited to natural fibers…. Yes I am a fly fishing techno file and I love every moment of it. So if you are truly a purist, I can live with that! Then be a true purist… tie a length of woven horse tail to the end of a piece of bamboo and have at it! As for me….. Bring on the technology and lets go fishing because I can’t wait to learn about the next new gadget that my fly shop has for me to check out! So Bob and I were out pounding some coffee colored water last night. Earlier in the day (while I was still at work mind you) Bob was hitting the Carp big time landing two and losing another. By the time I got on the water the bite was off and we covered a bunch of water and caught up on some much needed conversation. One of the guys up at International Angler had asked me if we had noticed more success with carp during a given time of day. As unfortunate as it may be, my reply was that I had no idea since my fishing sessions tend to be when I can sneak away between work and family and had little to do with when I thought the fish were actually feeding. Bob has spent quite a bit more time on the water recently than I have so he had a bit more insight than I did. The synopsis from our resident carp whisperer is that he has had the most success between 8:00-10:00am and between 3:00-5:00pm. Rather odd times but that is how it has gone and his track record is not to be second guessed at least not by me! So as we were wading, I made the off handed comment that of all the fish I had caught on our creek this season that I had been totally skunked out on cats. I thought this to be a bit odd since it is absolutely full of channel cats and I quite often throw bugger and leach patterns that channels typically love. Sunlight was fading and the creek started to darken. I looked at Bob and said, “Hey, lets head down to the big pool and finish there and then I can give you a ride back to your car”. We headed downstream and immediately saw something crashing bait all through the pool. My first thought was smallmouth. 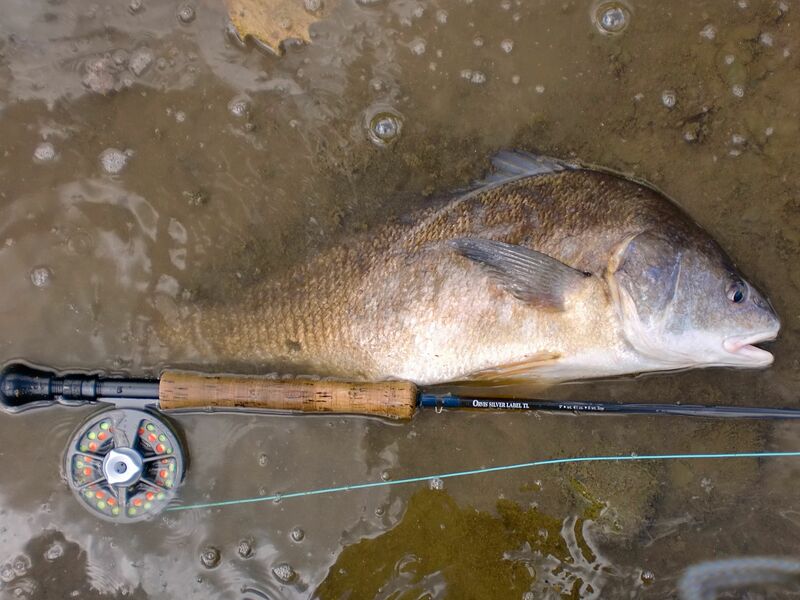 I had tied on the biggest blackest wooly bugger that I had in my box and began swinging it down through the pool. Strip… strip… strip… wham! Both of us saw the take and let out a “whoa!”. The fight was on and I was smiling because as soon as I felt the characteristic head shake I had a pretty good idea what I was into. The fight seemed to be coming to a close and as she got to within about 4 feet of me saw something she didn’t like (most likely me) and took off big time. I had to let line out for fear of breaking her off and was giggling the whole way. 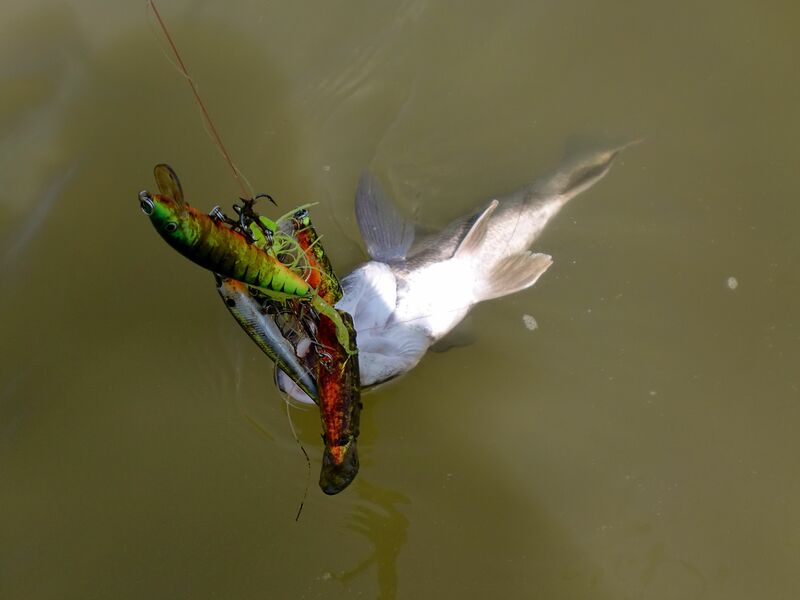 If you have never caught channel cat’s on the fly, you are missing out! They are agressive fish, will chase a fly and fight like mad. So after landing a second cat and fighting off some rather persistent mosquito’s we decided to call it a night. 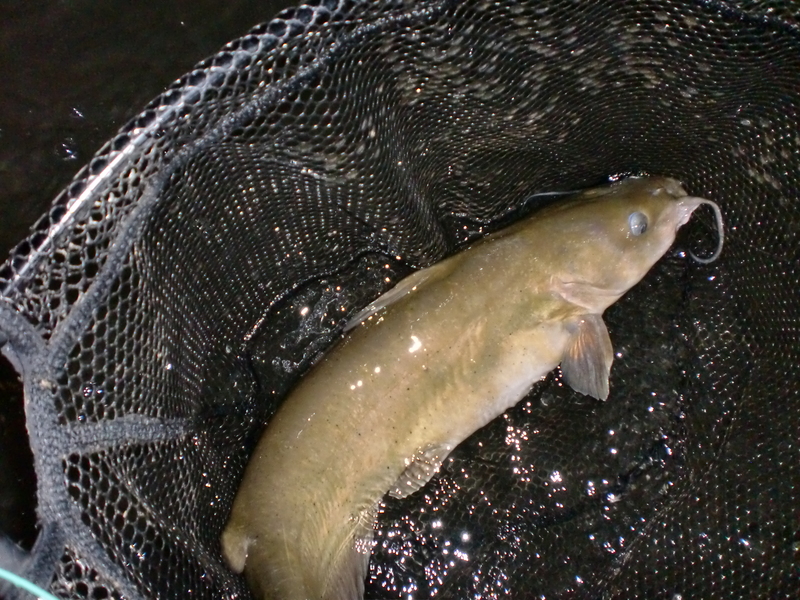 Two carp and two cat’s…. not a bad night of brown lining in my humble opinion! Well I decided that I needed to go to church today as it had been a while since I had a good worship session. I am a regular member of the Church of the Upstream Mend, although I will occasionally catch the minister over at the Church of the Tailing Loop as well. In any case, It was a beautiful day and I enjoyed getting out so I guess I just ought to shut my pie hole and get over my bad self. On a great note, my buddy Bob and I taught his kids Aidan and Bryce to tie a month or so ago and they went out today and caught their first fish ever on their own flies! Way to go guys!!! 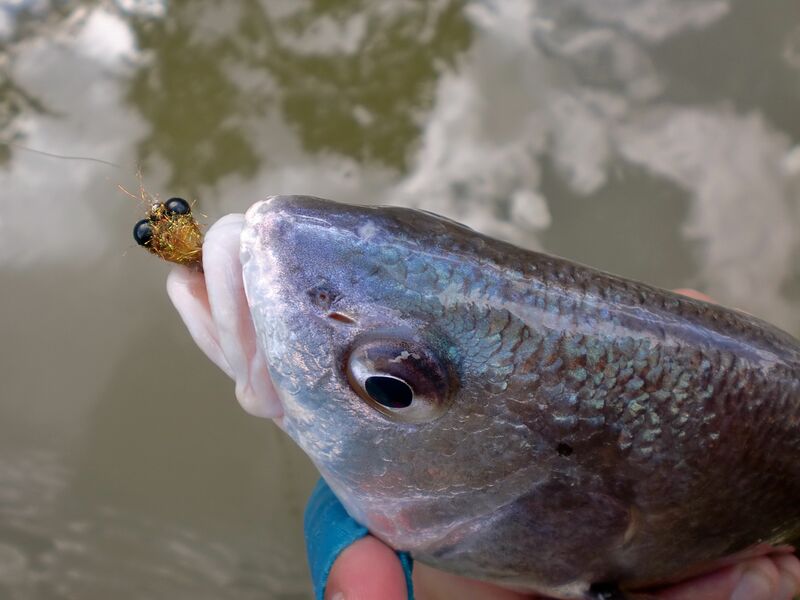 I still have the very first fly that I ever tied and caught a fish on…. 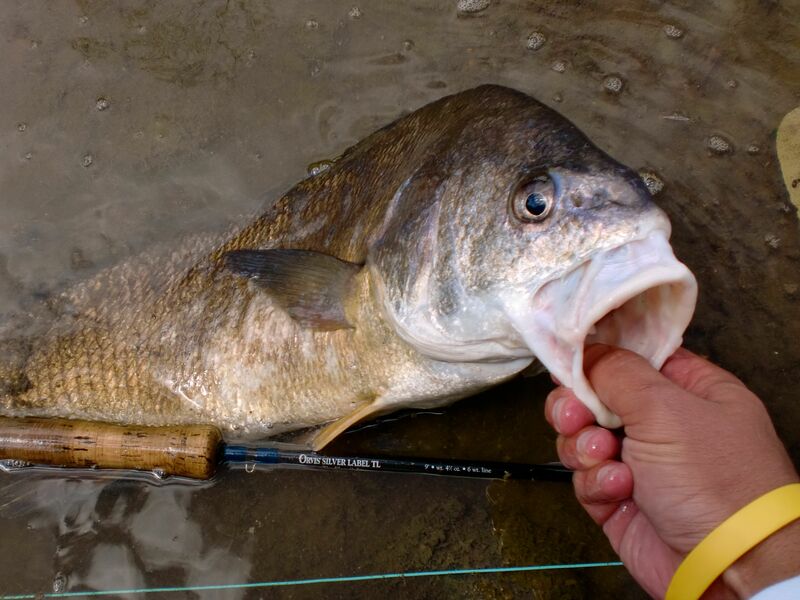 man, that was an ugly fly but I still remember how proud I was when I landed that 8″ grunt! Yesterday was an amazing day on the water. 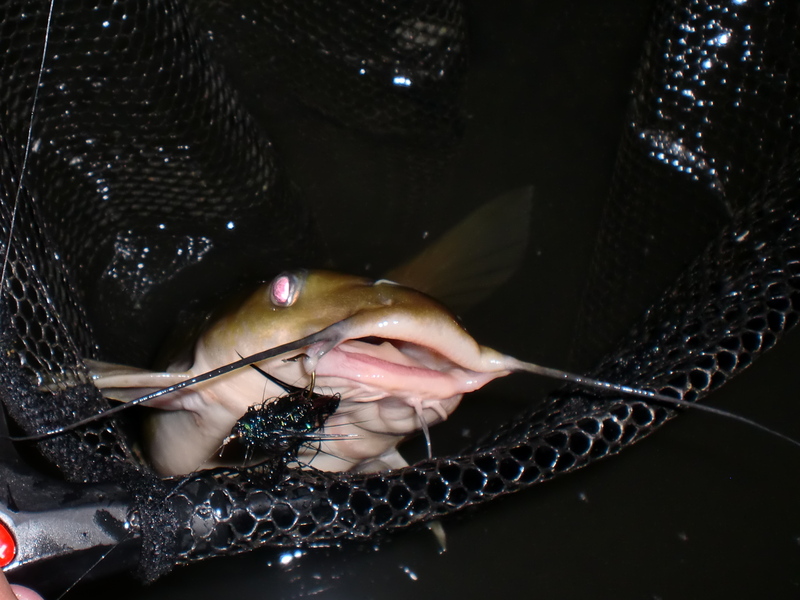 I lost a bunch of good fish during the fight…. 1 cat, 2 drum, 1 carp, and 1 beautiful smallie. It turns out the fly that they were keying on had a dull hook and I just could not seem to get a firm hook set with it. 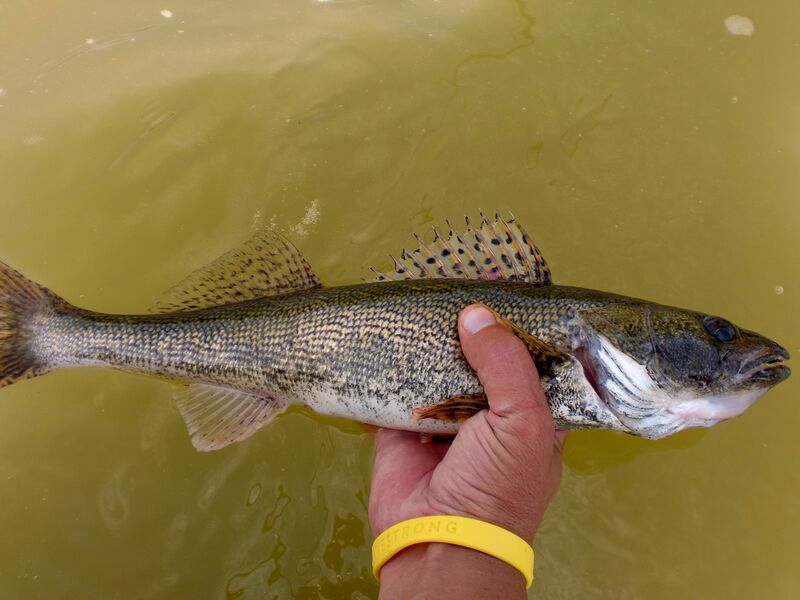 The silver lining was two Sauger that were my first of the year and caught me completely by surprise! If there is a lesson to be learned it is always be prepared with your fly selection and a hook can never ever be too sharp! Fall fishing is starting to heat up and I am soooo pumped!!!! As I was wading down stream I saw a fish swirl…. I cast to it but no take… it swirled again…. cast again.. no take. I approached closer and I realized something was not right. 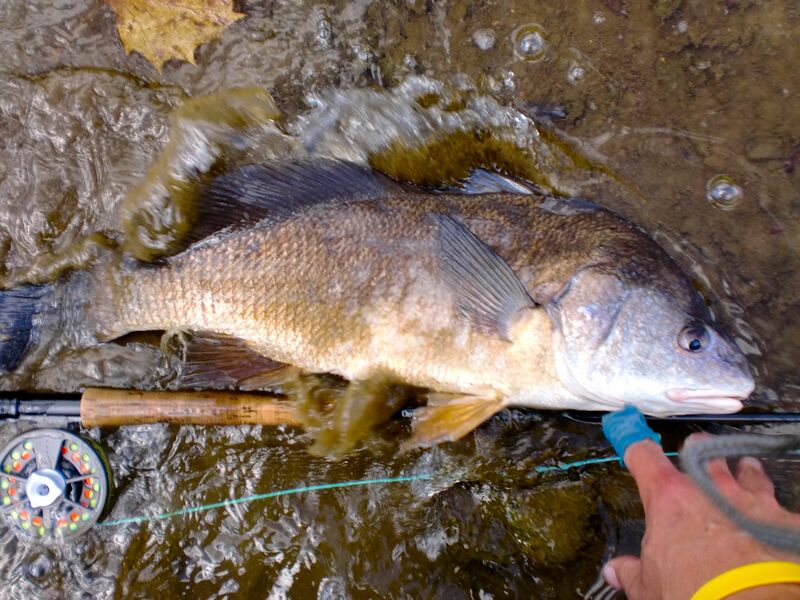 I could see the fish suspended in the water swirling in the current. I reached down and this is what I found…. I know we have all lost lures or flies before, but this was about 5 feet from shore in about 2.5 feet of water….. come on people! Give the fish a break and I sure as hell don’t want to wade through that crap. That was the not so pleasant surprise for anyone that got lost on the way to my mental playground! So I am not sure if I should consider today to be late summer fishing or early fall but in either way, it was a very nice morning on the water and a productive one at that. 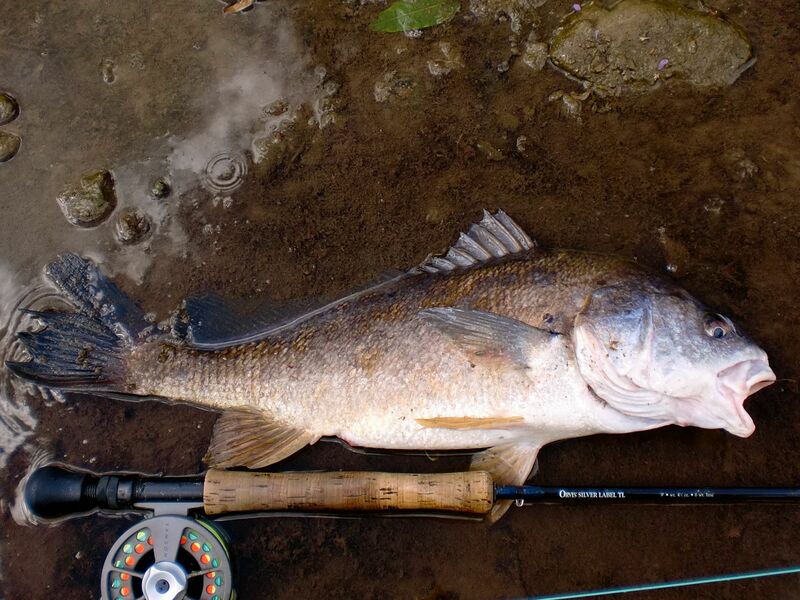 The smallies were still not in fall form and the carp were unusually absent, but the drum…. whole different story! I must admit, there is a huge satisfaction I get from site fishing and placing the fly exactly where I wanted it to be and watching the take. I don’t care if it is a tarpon or a bluegill (Ok… maybe I care a little) there is just something about stalking the fish…. presenting the fly…. 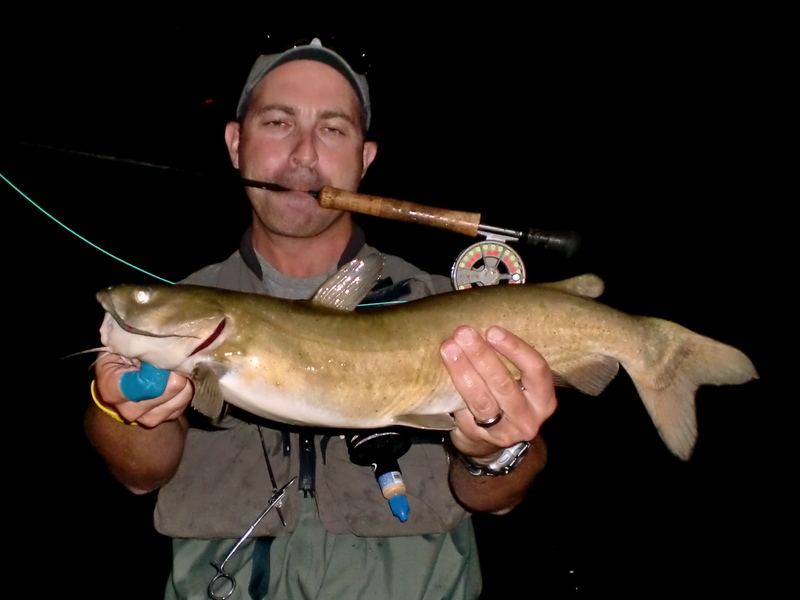 setting the hook….. and bringing the fish to hand that is nothing short of magical. So, welcome to fall and welcome to all things fly fishing!